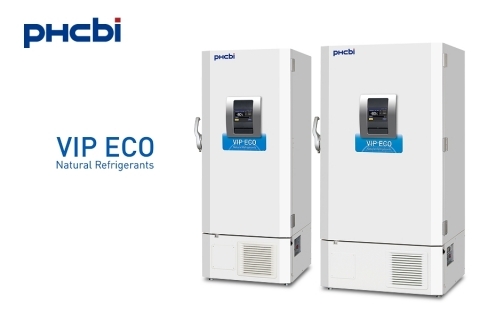 PHC Corporation (hereafter PHC), a wholly-owned subsidiary of PHC Holdings Corporation (headquarters: Tokyo, Japan) has introduced a new -85°C ultra-low temperature freezer VIP ECO series*1 using natural refrigerants*2 and new inverter compressors for the Japanese market. This product series comprising models MDF-DU702VHS1-PJ/DU502VHS1-PJ (single-phase 100V) is specially designed for pharmaceutical companies, research and medical institutions. 1. Natural refrigerants and new inverter compressors reduce energy consumption by approximately 20%. Incorporated in 2014, PHC Holdings Corporation is a global healthcare company. Its subsidiaries include PHC Corporation and Ascensia Diabetes Care Holdings AG. Committed to its corporate mission, “We contribute to the wellbeing of society through our diligent efforts by creating new value for all the people who wish for better health,” the company develops, manufactures, sells and services medical equipment and solutions through its three core businesses for medical devices, healthcare IT and life sciences. PHC Holdings Corporation group’s consolidated net sales in FY2017 marked 192.6 billion yen with global distribution of products and services for more than 125 countries. PHC Holdings Corporation changed its name from Panasonic Healthcare Holdings Co., Ltd. in April, 2018.